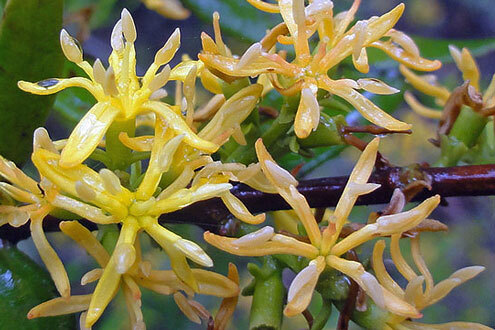 One of the glorious moments in the Blue Mountains bush is to find a rare plant in full bloom. 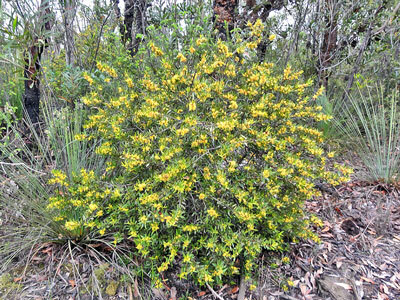 So it was with Atkinsonia ligustrina that Rae Druitt and I found on the west side of the Mt Hay Road in Leura in late November. There were three plants, the middle one of which was nearest the road and easily photographed. Its spectacular yellow flowering made it stand out for all to see. At first glance it resembled Persoonia myrtilloides, another rare plant, but we soon changed our minds when we found that unlike all Persoonias in which four sepals roll back down the corolla, this plant had six strappy petals, sometimes seven or even eight, and they were spreading. Not only that but the anthers were adnate and very pale. 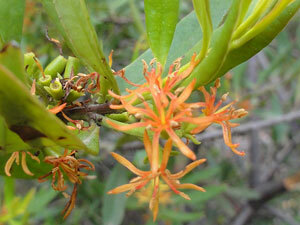 Atkinsonia ligustrina is a robust upright shrub with many red–brown stems that divide into a canopy of smooth, red–brown, brittle branchlets. The leaves are opposite, although at times appearing randomly placed because one or more leaves has fallen. Each leaf is elliptic, spreading, green (and bright green when new), (20)–25–(30) mm long, (5)–7–(10) mm wide, discolorous and slightly fleshy, the lower surface covered in felted hairs; apex obtuse; base tapering; margins entire; petiole about 2 mm long. The inflorescences (in November) are axillary, in racemes almost the same length as the leaves, up to 8 tubular flowers on each raceme, pedicels short, petals narrow, strappy, yellow, spreading and about 7 mm long; anthers adnate, short, pale. They are not persistent, and all fruit will have fallen (or been eaten) before flowers set for next spring. Picked fruit turn black within days. 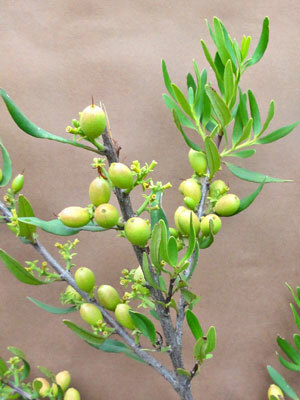 Atkinsonia ligustrina is a member of the family Loranthaceae, the mistletoes, which includes common genera such as Amyema and Muellerina. 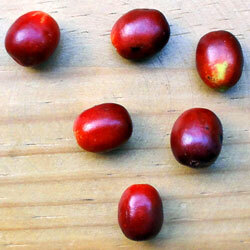 All are hemiparasites on other plants, especially eucalypts. However, Atkinsonia ligustrina is unusual in that it is the only one of this group that is terrestrial, and not epiphytic. It is a hemiparasite on the roots of neighbouring trees and shrubs: it obtains nutrients from them, but its own leaves make chlorophyll. The four families, Olacaceae, Loranthaceae, Viscaceae and Santalaceae make up the Order of Santalales, the parasitic plants. Atkinsonia ligustrina is classified a rare plant, ROTAP 2RCa, which means that it has a maximum geographic range of less than 100 km, that it is rare, that it occurs in a National Park, and that it is adequately conserved. It occurs mostly in the upper Blue Mountains, but has been recorded as far south as Yerranderie and as far northeast as Mellong. Atkinsonia ligustrina was named by Ferdinand von Mueller, the great nineteenth century botanist and Director of the Royal Melbourne Botanic Gardens and Herbarium, to honour a remarkable lady who lived and worked in the Blue Mountains at Kurrajong Heights - Caroline Louisa Waring Atkinson. 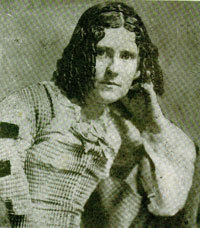 Read David Coleby's profile of Louisa Atkinson here. Reed, Sydney, ISBN 0 7301 0400 1. Kangaroo Press, Sydney, ISBN 0 7318 1031 7. State Library of New South Wales, ISBN 0 7305 8934 X (pbk).